Rabbi Schertz received his semicha from Yeshiva University in 1969. He also received masters in Jewish Philosophy from YU’s Bernard Revel Graduate School. He has a second masters in the History of Ideas from New York University, and a PhD from New York University in the History of Western Thought. He taught Classics in Pennsylvania State University and Philosophy at Regis College in Denver, Colorado. Rabbi Schertz served as the Rabbi of Kesher Israel Congregation in Harrisburg, Pennsylvania for over 25 years and is currently retired and living in Harrisburg. What is most striking when we encounter the mitzvah of the Shofar is the emphasis placed by the Rabbinic tradition that understood the mitzvah as being fulfilled through the hearing of the shofar sound and not through the act of blowing the shofar. The Gemara elaborates upon this ruling as follows: “Rav Huna says, this [distinction] was learned only for those standing on the edge of the pit. But those standing in the pit fulfill their obligation.” Ibid. Rashi explains that those standing in the pit always hear the sound of the shofar. See Ad Locum. We thus encounter an unusual situation, where the one who blows the shofar is unable to fulfill his obligation while those who hear his blowing are able to fulfill their obligation. The Lechem Mishna tries to explain this anomaly by maintaining that in the case of the shofar, the one who blows should not be considered an agent for the one who hears and that both actions are not equally mandated for the fulfillment of the mitzvah. At best, the blowing of the shofar is merely a preparation for the mitzvah which is the hearing of the shofar. See Lechem Mishna on Mishneh Torah Shofar I:1. The Minchas Chinuch offers a commentary on this Halacha which is markedly different than the understanding of the Lechem Mishna. It is ironic that he also utilizes the Tur as his basis. The Tur states: “An individual who does not blow [the shofar] his friend can blow for him to enable him to fulfill his obligation. This is like all the commandments where one person can allow another to fulfill his obligation through him.” Tur, Orach Chaim 594. This in turn is based upon the following Talmudic passage: “an individual who did not blow [the shofar] his friend can blow for him.” Rosh Hashana 34b. The Minchas Chinuch thus changes the entire perception of the mitzvah of Shofar. Rather than a unique mitzvah where the hearing is primary and the act of blowing is not a mitzvah at all, but rather a preparatory act for the hearing [Hechsher Mitzvah], the blowing now becomes an essential aspect of the mitzvah itself. It appears very similar to the Halachic principle of Shomeah K’oneh where the one who hears the mitzvah is considered like the one who says the mitzvah, e.g. kiddush, havdalah or the reading of the Megillah. By placing emphasis on the role of the blower as equal to that of the hearer, has not the Minchas Chinuch reversed the whole process? The blower now becomes the major component and the hearer becomes like the blower. It should be noted that apparently in support of the Minchas Chinuch, the Beit Yosef maintains that after the fact, if one recited the benediction “to blow the shofar” it is nevertheless valid. Beit Yosef on Tur 585. If the Minchas Chinuch’s analysis is correct and blowing is of equal importance with the hearing why then does the Rabbinic tradition go to such lengths to emphasize that only the hearing is important and the blowing is understood to be simply co-incidental. By having the blower recite the blessing, “to hear the sound of the shofar” we have, in fact, reversed the entire tradition of Shomea K’oneh and now proclaim Oneh Keshameah that the blower is now to be recognized merely as one of the listeners. In order to truly understand this problem and recognize why it was crucial for the Rabbinic tradition to disregard what appears to be the natural course of the halacha and emphasize the opposite, i.e. that the mitzvah primarily resides in the act of listening, it is important to first analyze what is the basic purpose for the mitzvah of shofar and why it is so crucial to hear it on Rosh Hashanah. These interpretations indicate that the purpose of the Shofar is to affect the individual and have him strive for personal development and attach him closer to God. It thus becomes what is known as Mitzvat HaGuf, i.e. a commandment which applies specifically to the individual as are the commandments of wearing the T’fillin or eating the matza. To best accomplish that end it is understandable that the primary aspect of the shofar is to hear its sound rather than to blow it. Hearing is a passive act which stirs both the soul and the mind and allows the individual to focus upon his past life and the process of self improvement or T’shuvah. If the emphasis was placed upon the blowing of the shofar, then one would give his full attention to the act of the mitzvah of blowing and not to the meaning of the sounds which that blowing connotes. There is a totally different concept for blowing the shofar on Rosh Hashanah which essentially contradicts the role of the shofar for the individual and focuses primarily on the community. There are several conflicting passages in the Talmud which leads to various Rabbinic interpretations about this aspect of blowing the shofar. . . .when one hears the [shofar] blasts he should do so according to their order and according to the order of the benedictions. This is so only in a case of a communal setting. In the absence of a communal setting, one can hear the shofar either in accordance with the order [of the benedictions] or not according to the order of the benedictions. Rosh Hashana 34b. Rashi explains that unlike other occasions, e.g. regular fast days where both benedictions are recited and the shofar is sounded, the two are not inherently connected. One could recite the benedictions and not blow the shofar and the benedictions would remain valid. On Rosh Hashanah, however, they are inherently connected; not doing one would invalidate the other. The Shofar is the conclusion of the benedictions. As Rabba explained, the Shofar is the method or process through which the benedictions are expressed. Thus, one could argue that if the benedictions are Torah obligation on the Congregation, the shofar blasts which are connected to them must also be of Torah origin. Rabbi Yossi Bar Yehuda says. . .it [the Torah] says, “and they shall be to you as a rememberance before your God” [Numbers 10:10.] There is no need to conclude the verse with “I am the Lord your God.” Why does the Torah state “I am the Lord your God?” It establishes a foundation. Every time Rememberances are stated, Monarchy should be included with them. Rosh Hashana 32a. 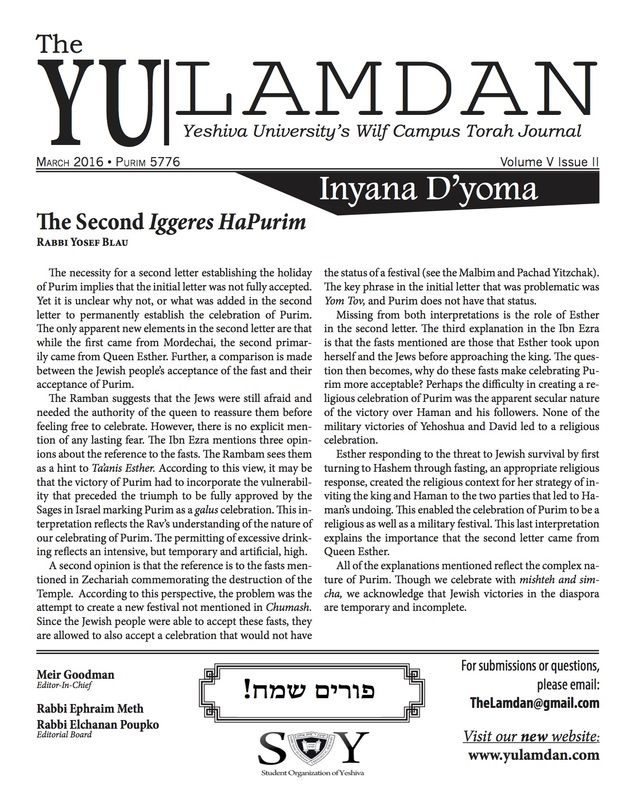 The Rabbenu Chananel adds the following citation: “We have thus learned from the Torah that one must mention Zichronot, Shofrot and Malchiot.” The statement by Rabbi Yossi Bar Yehuda and the citation by Rabbenu Channanel clearly seem to indicate that the benedictions of Malchiot, Zichronot and Shofrot and the shofar blasts that are connected to them are based on the Torah and establish a Torah obligation. We thus see that there is a separate aspect of the mitzvah of shofar which is rooted in communal observance. From the passages cited above, it appears to be a Torah requirement in a manner which is similar to a communal sacrifice. If it is a Torah requirement, how does it relate to the concept of an individual obligation? Can there be two commandments to hear the shofar, one for the individual and one for the community? These difficulties cause other commentaries to radically disagree with the understanding of Rashi and the Rabbenu Chananel. They maintain that there is only one mitzvah of shofar and that it is totally based upon an individual responsibility. The communal aspect must thus be of purely Rabbinic origin. On all other occasions [fast days] one can recite whatever he knows and blow whatever he can. But on Rosh Hashana, it must be all or nothing when it comes to benedictions and Tikiyot. Rosh 14. The Ran basically offers the same analysis, but he presents an alternative interpretation about the uniqueness of Rosh Hashana as opposed to other occasions where the shofar was blown, like fast days. Not only is it an issue of either saying all or nothing, but even if he knows all the benedictions and Tikiyot, but did not say them or blow them in the proper order, they are invalid. “Until he blows according to the order and recites according to the order.” Ran 11b “T’nan”. It is interesting that the Sefer Hachinuch makes no mention of any communal obligation. He also does not indicate that the shofar should be blown according to the order of the benedictions. The Rambam however does include both concepts. The Rambam does not indicate whether this obligation is of Torah obligation or whether it is a Rabbinic requirement. At the end of chapter 3 it appears clear that it is of Rabbinic origin. . . .If there are two cities and he knows for certain that one city there is someone who can recite the nine benedictions, but there is no one who can blow the shofar. In the second city, there is a doubt whether anyone can blow the shofar, but it is certain that there is no one who can recite the nine benedictions, he must go to the second city for blowing the shofar is a Torah obligation while the blessings are of Rabbinic origin. Rambam, Laws of Shofar, 3:13. This ruling is based on the principle that we must rule with stringency on any issue of doubt (safek) of Torah origin, even when pitted against a Rabbinic certitude. Finally, the Rambam states, “the shofar blasts do not nullify the benedictions and the benedictions do not nullify the sound” [Ibid]. The Raavad stipulates, however, that, “When it comes to the case of Rosh Hashana the shofar blasts and the benedictions do nullify one another.” On Rambam Laws of Shofar, 3:13. The basic objections that the Tosafot, the Rosh, the Ran, and perhaps the Rambam have to the understanding of Rashi and the Rabenu Chananel are two cases in the Talmud which appear to contradict their (Rashi and Rabenu Chananel) analysis that the benedictions of Rosh Hashana and the blasting of the shofar were connected one to the other and both had to follow the established order. One case was a situation where one had to choose between going to a city where he could hear the benedictions, but not the shofar, or to one where no benedictions would be heard, but there was the possibility of hearing the shofar. In that case, one should always take the chance of being able to hear the shofar. Rosh Hashana 34b. The other case was if one had already heard the benedictions without the shofar and a shofar became available, he must hear the shofar without regard for the benedictions. Rosh Hashana 34b. The position of Rashi was that without the shofar, the benedictions had no meaning. In addition, this (that you had to hear the shofar with the benedictions) was only true when the blowing of the shofar and the benediction was done publicly as way of enthroning God. Indeed, it was the sounds of the shofar which gave meaning to the blessings and were their proper conclusion. The sounds were the means which allowed the meaning of the benedictions to appear before God. In all other cases, including private situations, as the Raavad had already pointed out, where the purpose of the shofar was to enhance the process of T’shuva, the shofar could be heard without the necessity of any benedictions. Rashi and the Rabbenu Chananel could easily maintain that the two cases listed above (i.e. the case of the two cities, and the shofar coming afterwords) referred primarily to the aspect of T’shuva which the shofar enhances and not the enthroning of God. Both aspects of the shofar could thus fulfill a Torah requirement. When it comes to modern times, the ruling about the mitzvah of the Shofar is stated in more confusing terms. It is obvious that there is an attempt to combine the various contradictory positions that we have cited about the Rabbinic or Torah origins of the communal shofar blowing as well as the mitzvah incumbent upon the individual into one comprehensive system where each part is duly accounted for. A good example is found in the Chayai Adam. The Chayai Adam states that the essential [ikar] aspect of hearing the shofar should be according to the order of the mussaf benedictions. This implies that it is the mussaf benedictions which establishes the Torah origin of the shofar blasts. Nevertheless, at the same time he maintains that the Torah requirement to hear the shofar has been fulfilled by hearing the shofar during the morning service which were enacted by the Rabbis in order to confuse the Satan, without any reference to the mussaf benedictions. How could the important mussaf benedictions be so easily disregarded? Despite these difficulties and no matter whether the mitzvah hearing the shofar according to the blessings is of Rabbinic or Torah origins, the dual aspects of the shofar, the individual and the communal, present an opposing philosophical perspective. There is a clear distinction between hearing the shofar as an individual as opposed to the communal obligation. The Jew as an individual is prone to the same faults and weaknesses as other human beings. As was indicated above, by the very nature of his human existence, he is prone to be removed from God and is subject to moral, religious and ethical transgressions. He must be shaken from that existence and reminded to return to God, i.e. undergo the process of T’shuva. That reminder is most powerfully expressed by the sound of the shofar on Rosh Hashana. The Jewish people as a community, however, are a unique people, having been chosen by God to receive his Torah. Only such a people can properly enthrone God as king of creation and appreciate his revelation and hope to be remembered by Him for good and not evil. Thus, the sound of the shofar is a sound of coronation of the king of the universe. For the Jewish community, the sound of the shofar is the sound of pride and triumph, not of humility and fear. It is only proper that the sound of our individual weakness which we express at the end of the morning service, is transformed on the same day to the sound of glory and strength which is demonstrated by the shofar which concludes the Malchiyot, Zichronot and Shofrot. In this manner, it is the dual nature of the shofar which addresses on Rosh Hashanah both our greatest failings and weakness as individuals, but glorifies the strength and eternity of our people.